An estate gift from Jean & Mora Morris leaves a legacy on Delaware County organizations. Jean and Mora Morris started their life together humbly. The couple married in 1933. Dr. Morris started his surgical residency at Ball Memorial Hospital in 1934, earning $10 a month plus room and board. Mrs. Morris, a Muncie native, worked as a home economics teacher. While they never had any of their own, the couple shared a passion for the well-being of children. They also kept ties to Muncie even after moving to Hartford City in 1936. 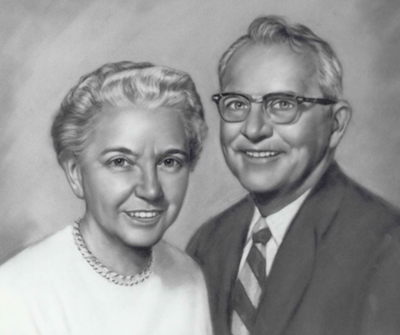 During their life together, the couple supported a variety of community organizations, but they always had a special interest in community programs that supported youth. After her retirement and the death of her husband in 1991, Mrs. Morris spent her time and energy volunteering, advocating, and giving back to many worthwhile causes. But, Dr. and Mrs. Morris’ impact didn’t end there. Mrs. Morris had named The Community Foundation in her estate plans, resulting in a $2 million gift designated to support nine specific charitable organizations and other youth programs. Due to the generosity of the Morrises, the following organizations receive annual support for their youth-serving programs: Boy Scouts Golden Eagle District of Crossroads Council, Girls Scouts of Central Indian, YWCA, YMCA, Big Brothers Big Sisters of Delaware County, Hillcroft Services, Muncie Children’s Museum, Youth Opportunity Center and Muncie PAL Club. The Boy Scouts of America used their distribution to support their 2017 programming. During 2017, the local Golden Eagle district saw a 2.5 percent increase in youth membership – 40 new youth participants. The district reported more than 10,000 civic and Eagle service hours. There were 34 young men who earned the Scout’s highest ranking of Eagle Scout. More than 430 adults volunteered their time to mentor young people. The Girls Scouts of Central Indiana used their distribution to support their programming to more than 1,110 girls in Delaware County. Muncie Children’s Museum celebrated its 40th birthday with a yearlong celebration in 2017. With their distribution, the Muncie Children’s Museum offered a FREE community concert in June at Canan Commons featuring Lucky Diaz and the Family Jam Band. Kids and their families got up, got moving, and learned through fun – one of the goals of the Muncie Children’s Museum! The YWCA of Muncie used their distribution from the Morris Fund for Youth to support their Emergency Shelter Program which provides 45 days of temporary housing for women and their children. The YWCA also provides extended shelter stays for women who need additional time and case management to assist them in moving from crisis to self-sufficiency. The YWCA has seen an increase in the number of women and children served each year – 683 in 2017. One client found her way to the YWCA after a series of events stemming from an injury. “I couldn’t go back to work because of an injury and lost my job because of this. I was out for two quarters, which made me ineligible for unemployment or compensation. I lost my apartment because of this and was forced to move in with a friend. It became a bad relationship, and then I heard about the YWCA. I was afraid, at first. “I think that it’s a positive thing and it’s a good thing for people to have a safe place to go when they are in a tough situation. Having running water, a refrigerator that works and support that the YWCA provides are things that are important. People come from all walks of life, and any of us can find ourselves in this position. The YWCA definitely has made a positive impact on my daughter, me, and the community. She is in 5th grade. She made the honor roll, the volleyball team, and even made new friends. Our room at the YWCA is decorated with all of her favorite hello kitty pictures- and we feel safe. Everybody that works here seems to be reaching out to help us and I appreciate that. “Muncie needs this place. If it weren’t for the YWCA, I wouldn’t have my daughter, I wouldn’t have a job, and I probably would’ve gone back to my abuser because I had no place to go. It has benefited me in the sense that I have a safe place to live with my daughter. Jean and Mora Morris’s legacy lives on through grants from their fund. Since the fund was established in 1994, $2.77 million has been distributed to youth-serving organizations.